Buy Online Now! – Classic Audioslave Concert Posters and Memorabilia. Audioslave was an American rock supergroup formed in 2001. The four-piece band consisted of Soundgarden lead singer/rhythm guitarist Chris Cornell and Rage Against the Machine members Tom Morello(lead guitar), Tim Commerford (bass/backing vocals), and Brad Wilk (drums). Critics first described Audioslave as a combination of Soundgarden and Rage Against the Machine, but by the band’s second album, Out of Exile, it was noted that they had established a separate identity. 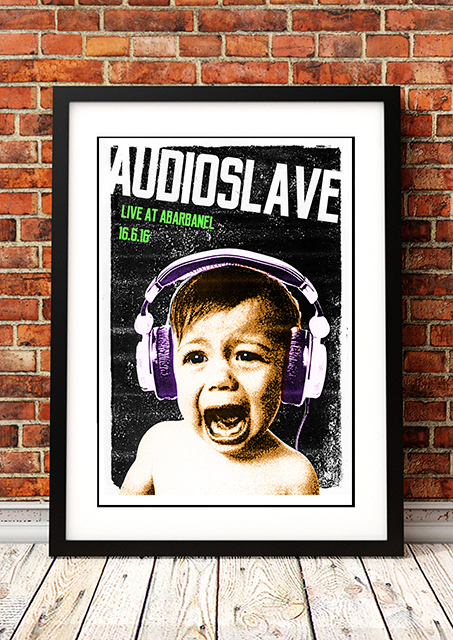 Audioslave’s sound was created by blending 1970s hard rock with 1990s alternative rock. Moreover, Morello incorporated his well-known, unconventional guitar solos into the mix. As with Rage Against the Machine, the band prided themselves on the fact that all sounds on their albums were produced using only guitar, bass, drums, and vocals. Audioslave disbanded in February 2007. On January 20, 2017, three days after announcing their reunion, Audioslave performed together for the first time in over a decade at Prophets of Rage’s Anti-Inaugural Ball. In the early hours of May 18, 2017, Chris Cornell was found dead after playing a Soundgarden show. We stock an awesome Auidioslave Print.